Cambridge Audio Go review | What Hi-Fi? The Cambridge Audio Go continues the hi-fi company’s successful track record with wireless speakers by turning in a stellar performance at a very attractive price. At £120, it’s a class above the rest when it comes to portable Bluetooth speakers. Its predecessor – the Minx Go – made a huge splash last year, even grabbing a Product of the Year Award in the wireless speakers category. The new Cambridge Audio Go has plenty more to offer (more features, a smarter design), while also delivering a fun, detailed sound that makes it an even better proposition than before. The Cambridge Audio Go is £20 pricier than last year’s model (the Minx Go cost £100), but it comes with a host of added features. The new Go has the higher quality aptX codec for Bluetooth streaming and NFC one-touch pairing (for compatible smartphones) – both welcome additions. You also no longer need to keep the Go plugged into the mains if you want to use the USB-charging feature. It’s a neat upgrade, as you can simply plug your smartphone into the USB port and charge while on the move. And considering the Go’s powerful lithium-ion battery can last a massive 18 hours on a single charge, there’s plenty of juice left over to stop your smartphone from dying while still churning out tunes on a weekend away. The 3.5mm input is available for plugging in other music players, while a single LED in front indicates Bluetooth pairing status. There’s a smattering of design tweaks to give a more polished look and feel to the Cambridge Audio Go. We like the dedicated buttons for the inputs, volume up/down and power. The backlit icons are a nice touch, too. The Go has a sturdy, quality feel to it, yet it’s light and compact enough to be easily portable. We reckon you could comfortably fit the small speaker inside a large handbag. It’s available in white or black, and the satin finish further adds to its smart design. The little foot that swivelled out at the base has also been removed, and the Go can now stand on its own securely. Altogether it’s a neater design. Even though we’ve heard what Cambridge Audio can do with small wireless speakers, it’s still a surprise to hear such a dynamic, punchy and detailed sound from the Go. Stream Blue Swede’s Hooked On A Feeling from Spotify, and the Go sounds like it’s having a world of fun. The sound is full-bodied, the rhythm is snappy and enthusiastic, and it can go admirably loud, while remaining controlled and cohesive. We like the amount of weight underpinning the Go’s solid sound. The basslines in SBTRKT’s Wildfire dig deep and punchy – a great feat for a cabinet of such petite dimensions – and the textures are fleshed out with rich detail. The Go never seems to run out of energy, charging through Eminem’s blistering raps as confidently as it subtly conveys a Kate Bush track. It’s detailed enough to wring out the nuances in voices, which are crisp and direct without being pushed too forward. It’s a wonderfully easy listen. Lesser speakers of this type can sound tinny or harsh, but the Go’s treble comfortably reaches clear highs that have excitement and bite. It’s a touch smoothed off, but we’d happily take this balance over a shrill or bright top end. Once again, we’re impressed and entertained by the Cambridge Audio Go. The portable speaker has plenty of talents that belie its compact size, and we love how easy it is to use, and to listen to. 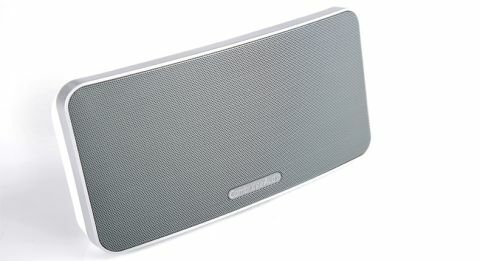 Few wireless speakers offer such a great combination of build quality, portable design, long battery-life and enjoyable performance, especially at the £100 mark. With its bold and likeable performance, the Go is already on our must-have Bluetooth speakers list. And it should be on yours, too.